What is the purpose of laws? John Locke taught us that the primary role of government is to protect the sovereign rights of man, namely his Life, Liberty, and Property. “The end of law is not to abolish or restrain, but to preserve and enlarge freedom. For in all the states of created beings, capable of laws, where there is no law there is no freedom. For liberty is to be free from restraint and violence from others…” In other words, laws derive from the laws of nature, particularly human nature. Laws serve the good in man and punish the evil. Laws protect the good members of society and therefore encourage such conforming behavior, while punishing and deterring bad conduct. Therefore, the good of society is served and rightful expectations are rewarded. Citizens agree to abide by laws with the implied understanding that laws are instituted to protect them and their general liberty interests, as our republic itself is designed. As we move farther away from the urgent liberty concerns of the Revolutionary War and even the second World War, as we care less and less about how secure our freedoms are, as we care less and less about the warnings our Founding Fathers left for us, and we begin to care more about our high standard of living and our comfort, we see the consequences of that transition….. envy, irresponsibility, crime, and corruption. The power to regulate and manage the election process is a state power. The power to assure accurate voter records in a state power. In the developing conscience of human rights, state sovereignty has also come to mean that a state has the sovereign right to “protect” the rights of its citizens. Unfortunately, when laws become too numerous and detailed, they can destroy liberty just as surely and effectively as having no law. But sometimes that becomes necessary. Sometimes, when enough people can’t conform their conduct under the laws and the rights of others suffer, then additional laws and regulations become necessary. We saw this with the Civil Rights Fourteenth amendment, the 1965 Civil Rights legislation, forced integration and bussing, and things like curfews. Look at the Castle Doctrine, which provides property-owners with greater protection should they happen to shoot a trespasser with evil intent who breaks into their home. With violent crime so clearly on the rise, this law empowers innocent citizens to defend their family and property. It says that persons should not have to risk the safety of their loved ones by waiting until the last possible moment to discern the intent of someone who has broken into their home. While the doctrine might result in the death of a trespasser and therefore seem an unfair piece of legislation, it is necessary to safeguard the legitimate rights each person has in self-protection and in protection of his family and property. Look at the judicially-mandated (racial) desegregation plans that many counties in the South still must adhere to in 2012. Parents wonder why they can’t have community-based schooling so that class sizes will be smaller, represent their communities, and be more responsive to neighborhood interests and concerns. These seemingly important concerns are outweighed by the need to have classes achieve racial quotas because of our history of racial intolerance. Sometimes we just have to look at the totality of the circumstances to understand why we need certain laws and regulations. 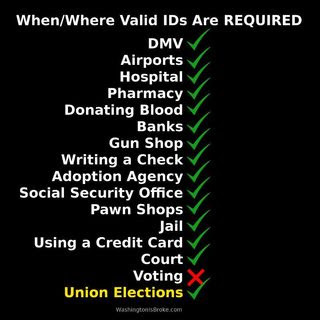 Voter ID laws are one such law. I live in North Carolina and we are currently engaged in a straight Democratic – Republican struggle over a Voter ID law. Here is where we currently stand. A Voter ID bill (HB 351 – “Restore Confidence in Government”) was passed last year in both the House and Senate. It received overwhelming popular support. But when it went before NC Governor Perdue, she vetoed it. When the House attempted to over-ride the veto, Democrats refused to cross party lines and therefore, the bill could not be resuscitated. And there it still stands… in limbo. North Carolinians recently learned that the Republican leadership might sell the people of the state out by watering down the bill and making its identification provisions essentially meaningless in order that Democrats will sign on. Although the state legislature knows the will of the people and has heard them loud and clear, they are intent on moving forward with this compromise bill. Apparently, a bad bill is better than no bill at all. According to Susan Myrick, a writer for the Civitas Institute, although the compromise has not yet been revealed, the House Republican leadership is determined to search out new language that would meet the approval of at least four Democrats. Four is the magic number in order to be able to over-ride Governor Perdue’s veto. The cost to gain these four Democratic votes is high, for the new language will have to weaken HB 351 to the point where it would concede the intent of the law and provide very little assurance that voters will prove their identity before voting. As Myrick has noted, House Speaker Thom Tillis (R-Mecklenburg) has conceded in interviews that the compromise bill will probably contain some of the same provisions provided in a short-lived 2011 compromise to HB 351 which would allow NC voters to use utility bills, bank statements and voter registration cards as acceptable forms of identification. It would also allow voters who did not have any form of ID to show that their signature matched the signature on their voter registration. (Precinct officials would be the ones to determine whether signatures matched). I don’t see well at all without my reading glasses. And sometimes I don’t even see well enough with them on. I wonder if precinct officials have the same problem. At present, thirty states have laws in place that will require all voters to show some form of identification at the polls this November. That number could rise to thirty-two. While Mississippi and Wisconsin have enacted Voter ID laws, they have not yet been implemented. In Mississippi’s case, the strict “Photo ID Amendment” passed by citizen initiative in November 2011 requires both enabling legislation and pre-clearance under Section 5 of the Voting Rights Act before it can be implemented. In Wisconsin’s case, the state’s new strict Photo ID law was passed by the legislature in 2011 and was in effect briefly in the early part of this year until it was declared unconstitutional by a state judge on March 12, 2012. The state is barred from enforcing the law unless an appeal overturns the March 12 ruling. Alabama, South Carolina, and Texas all have Voter ID laws on the books but passed more stringent laws in 2011. Alabama’s new Voter ID law has a 2014 effective date and requires Section 5 pre-clearance, and both Texas and South Carolina were denied pre-clearance for their new Voter ID laws by the U.S. Justice Department. Of the 32 Voter ID laws that have been enacted, half of them require the voter to produce a photo ID while the other half provide that non-photo forms of ID are acceptable. So far, North Carolina has no voter identification law. I know opponents of Voter ID laws believe, or just simply buy into the hype, that requiring a valid identification to vote will somehow disenfranchise certain individuals by denying them the opportunity to vote. During the debate in 2011 for HB 351, black advocacy groups such as the NAACP claimed that if NC passes such a bill, minority voters will be denied the right to vote. They continue to impress that view upon the House Democrats. They feed racial paranoia that white establishment is forever looking for ways to keep the black population suppressed. They believe, as Rep. John Lewis (D-Ga) said on MSNBC’s “Hardball” with Chris Matthews, that “voting should be as easy as getting a glass of fresh water.” To them, any scheme other than that amounts to a poll tax and reinstates Jim Crow. It impacts and disenfranchises minority voters. When the bill was being debated last year, Reverend William Barber of the NAACP addressed a crowd at the “Rally Against the Photo ID Bill” in the NC Legislature on April 13. He told the crowd: “On April 13, 1963, Reverend Martin Luther King was in a Birmingham jail trying the move the country forward. And now the radical Republicans in this legislature are trying to take us backwards.” And yet there are no instances of blacks being denied the right to vote in North Carolina. Reverend Barber knows full well that the bill is aimed at protecting a process and is not motivated by any racial animus or any intent at all to disenfranchise a single voter. North Carolina is home equally to people of all colors and ethnicities. North Carolina’s Voter ID law, HB 351, like so many other state Voter ID laws, is neutral on its face and contains proper default provisions included. The bill is clear on its face that no person shall be denied the opportunity to vote legally. The goal of the bill is stated in its title – “Restore Confidence in Government.” It is not “Voter Disenfranchisement.” It is hard-pressed to see how any voter will honestly be prevented from voting. The only thing the bill really does is prevent someone from voting using another’s identity. Voter fraud destroys the integrity of that system and undermines the confidence of voters in the system which allows them to participate in their government and which ultimately protects their rights and interests. The real issue is not voter disenfranchisement but voter nullification. Each illegal and fraudulent vote cancels out the vote of a legal one. The overwhelming number of NC citizens conducts themselves everyday according to the law and they expect that politics should play no part in the process to pass good, common-sense laws for the good of decent, law-abiding citizens. As Justice John Paul Stevens noted in the 2008 US Supreme Court decision – Crawford v. Marion County Election Board, 553 U.S. 171 – which upheld the constitutionality of Indiana’s tough ID law, “requiring a photo ID imposes a minimum burden on voters’ rights, which is justified by state interests.” I would urge the members of the NC General Assembly to note the significance of Justice Stevens’ decision. Stevens was one of the more liberal members of the Court yet he recognized fundamental conservative principles and their relationship to one another. It would seem that liberals and conservatives can, in fact, come together on common ground for important issues affecting the concerns of citizens and political processes, without compromising core principles. In Crawford, Justice Kennedy reflected on the balance of interests that Voter ID laws touch on: The individual’s right to vote and a state’s legitimate interest in managing elections and ensuring their fairness and integrity. In order for our democratic republic to function and thrive, elections must be free of fraud. Safeguarding election integrity, therefore, is among the primary functions of state government. Kennedy wrote: “States have a valid interest in participating in a nationwide effort to improve and modernize election procedures criticized as antiquated and inefficient. They also have an interest in preventing voter fraud in response to the problem of voter registration rolls with a large number of names of persons who are either deceased or no longer live in the state. Such fraud has occurred in many parts of the country. Indiana’s own experience with voter fraud in a 2003 mayoral primary demonstrates a real risk that voter fraud could affect a close election’s outcome. There is no question about the legitimacy or importance of a State’s interest in counting only eligible voters’ votes. Finally, a State’s interest in protecting public confidence in elections, while closely related to its interest in preventing voter fraud, has independent significance, because such confidence encourages citizen participation in the democratic process.” Kennedy then turned to the potential burden to eligible voters who might lack a photo identification card. He noted that Indiana’s law provides for free ID cards to those who can show that they can’t afford them, as well as provides for ‘provisional ballots.’ He wrote that because the state provides free cards, “the inconvenience of going to the Bureau of Motor Vehicles, gathering required documents, and posing for a photograph does not qualify as a substantial burden on most voters’ right to vote, or represent a significant increase over the usual burdens of voting. The severity of the somewhat heavier burden that may be placed on a limited number of persons – e.g., elderly persons born out-of-state, who may have difficulty obtaining a birth certificate – is mitigated by the fact that eligible voters without photo identification may cast provisional ballots that will be counted if they execute the required affidavit at the circuit court clerk’s office. Even assuming that the burden may not be justified as to a few voters, that conclusion is by no means sufficient to establish petitioners’ right to the relief they seek” (which is the invalidation of Voter ID law). While the case addressed Indiana’s reasons for enacting its Voter ID law, the threat of fraud affecting the outcomes of local elections is very real here in North Carolina. We’ve all seen elections that have been won or lost by a few votes. On November 2, 2010, incumbent Washington County Sheriff James Ross won his race against David Hassell by only 4 votes. There were allegations of voter fraud, with four votes cast in the name of individuals who were deceased, and of voter intimidation, which involved a nursing home in the area for disabled and handicapped persons – the Roanoke Development Center. The Center, as it turned out, was operated by Dr. Zebedee Taylor, the Chairman of the Washington County Democratic Party, and allegations supported by actual testimony showed that residents were intimidated by workers into voting for the democratic ticket (“or you will lose your medical benefits and then what will you do?”). “The votes cast on behalf of the eleven handicapped voters by unauthorized person or persons did not reflect the expressed choice or the will of the voters.” On February 25, 2011, the State Board of Elections acknowledged that there were sufficient irregularities to taint the results of the election and ordered a new election. There were prosecutions in the event and no convictions. In fact, there wasn’t even any media attention. When I recently brought that bit of information up, as well as the news of at least four persons in Wake County indicted for voter fraud, a blogger responded that “no one cares about the inconsequential few voter irregularities in a two-bit sheriff race.” Tell that to the citizens of Washington County who are legal citizens and legally entitled to have their votes counted. Re-do elections cost the state money, erode confidence in the election process, and erode confidence and trust in state officials. According to recent opinion polls, 74-75% of Americans – including majorities of Hispanics and African-Americans – support a photo ID requirement for voting. Also significantly, 52-55% of voters who identify themselves as Democrats support the requirement. In North Carolina, 74% of citizens support the Voter ID bill, with 52% of Democrats believing it is necessary. The fact is that voter fraud exists. Average, well-intentioned voters understand that in this age of groups like ACORN and mass voter fraud, it is simply common sense to require a person to produce an ID at the polls. Average voters understand how easy it is for people to pretend they are someone else and therefore vote illegally and vote multiple times. This is especially so when voters know (or are informed) that voter rolls/voter files are not routinely purged of those residents who have died or moved. We’ve seen in states like Alabama, Missouri, South Dakota, Texas, Mississippi, Kentucky, and Indiana that voter rolls exceed the number of citizens/population (living people) in that state. To reference Haley Joel Osment, the young boy in the Bruce Willis movie “The Sixth Sense”: “We see Dead People.. everywhere…. and they’re voting!” So why don’t state legislatures or the US Department of Justice see them? A recent study by the Pew Research Center found at least 1.8 million dead people are still registered to vote. As Brian Williams explained: “There is some disturbing news about the state of this nation’s voting system in this upcoming presidential election year. The Pew Research Center says one in eight voter registrations in this nation is inaccurate, a quarter of eligible voters are not registered at all, 1.8 million dead people in this country are indeed still registered to vote. The study says the problems here are not due to fraud, but they stem from disorganized and antiquated systems that could use some help from technology.” But antiquated systems provide the opportunity to commit fraud. Investigative journalism has shown repeatedly just how easy it is to obtain a ballot by giving the name of a dead person who is still on the rolls. The nice thing about dead people is that they don’t complain or protest if someone votes in their place. One reason that the average voter, across both party lines and across all ethnicities, supports a photo ID voter law is that they know you can’t function in the modern world without showing ID. You can’t cash a check, pay by check, buy beer or cigarettes, get married, get on a plane, register for school, enter any federal building, or even rent a video without being asked for one. You can’t even enter the Governor’s Mansion in Raleigh or meet with Eric Holder in DC without producing one. If it’s important enough to secure the safety of public officials, why shouldn’t it be important enough to secure the integrity of the voting process. In April – May, for the primary election early voting period, I worked the one-stop voting sites for 13 days. I worked the most heavily trafficked site until it closed each day at 5:00 and then drove down the road to work the site that stayed open until 7:00. On primary election day, I worked my precinct for 12 hours, until closing. Voter ID was on everyone’s minds. Many voters made it known that they supported a voter ID. I can’t provide an exact figure for how many people told me that when they went in to vote, they intentionally pulled out their ID to show the poll officials but it was a lot. When the officials commented that an ID was not necessary, many said that they wanted to show it anyway to PROVE they are the person they claim to be. A few ladies told me that when the officials told them an ID was not necessary, they questioned them in detail as to how they can be sure the person voting is the real deal. The answer in all instances was the same: “We can’t.” A member of the Republican Women’s group told me that when she went in to vote, several people took out their driver’s licenses. Upon seeing that, the rest of the people in the room did the same. And yet another woman went into the polling location I was working and gave a fake name – a common name. When the official scrolled the names on the computer, the voter pointed to the screen and said – just to make a point: “That’s who I want to vote as today.” She, of course, proceeded to vote legally, but she wanted to show the officials just how easy it is to vote as someone else, especially early in the early voting period. Assistant: “Do you have an Eric Holder, 50th Street? [Note that O’Keefe’s assistant never identified himself as Eric Holder, so he was not illegally impersonating him]. Furthermore, the he never attempted to vote using the ballot that was offered to him, so the assistant himself cannot be accused of voter fraud. O’Keefe pulled a similar stunt in North Carolina. His investigators posed as foreign-born persons and attempted to vote. They used thick accents. Of course, O’Keefe filmed the exchange. The investigators repeatedly told the election officials that they would go to their cars to get their foreign passports, but the officials insisted that they don’t need to see them. As the officials told the “foreigners,” all that was required was that they sign the voter form with an “X” and then they could have their ballots. The results of the investigation showed just how vulnerable North Carolina’s electoral system is to voter fraud. As part of Project Veritas, an organization which investigates and uncovers voter fraud, members compared Jury Forms to Voter lists and what they found was troubling. There were hundreds who identified themselves as “noncitizens” on Jury Pool forms but yet voted in elections. So they voted illegally if their first claim is true but committed perjury if they in fact voted legally. For those who don’t think it’s worth the time to enact meaningful voter integrity procedures, remember the election of 1960 when John F. Kennedy was declared president amidst allegations of massive voter fraud. There were 68 million votes cast in the 1960 election. The margin of victory for Kennedy (Democrat) over Richard Nixon (Republican) was a mere 113,000 votes. Kennedy won the election with less than 0.2% of the popular vote (0.16%). Many Republicans (including challenger Richard Nixon and former President Dwight D. Eisenhower) believed that Kennedy had benefited from massive vote fraud, especially in Texas, where Kennedy’s running mate Lyndon B. Johnson was Senator, and Illinois, home of Mayor Richard Daley. The Washington Post wrote: “The election of November 8 was characterized by such gross and palpable fraud as to justify the conclusion that [Nixon] was deprived of victory.” Chicago was not only known for its powerful Democratic political machine but also for the power of one of its most notorious mobsters, Sam Giancana. It was rumored that both Mayor Daley and Giancana and the Chicago mafia played a critical role in Kennedy’s victory in Illinois. In the 1992, Giancana’s nephew wrote a book (“Double Cross: Inside Story of the Mobster Who Controlled America”) in which he recounts how his uncle rigged the election in Cook County (Chicago being the seat). Kennedy won Illinois by less than 9,000 votes out of the 4.75 million votes that were cast, which reflected a margin of 0.2%. Yet Nixon carried 92 of the state’s 101 counties. Kennedy’s victory in Illinois came from the city of Chicago, where Mayor Daley suspiciously held back much of Chicago’s vote until the late morning hours of November 9. When the votes were turned in that morning, Kennedy took Cook County by an extraordinary 450,000 vote margin, which represented more than 10% of Chicago’s 1960 population of 3.55 million. This was alarming since Cook County also included many suburbs outside of Chicago’s borders which happened to turn in a heavily Republican vote. Earl Mazo, a reporter for the New York Herald Tribune at the time, investigated the voting in Chicago and claimed to have discovered sufficient evidence of vote fraud to prove that the state was stolen for Kennedy. Among the evidence he found was a cemetery in one Chicago precinct where the names on the head stones were registered voters who had actually voted and an address that 56 Kennedy voters listed as their address. What he found was an abandoned, demolished house. The Republican National Committee filed a lawsuit challenging the Chicago results, but amidst another cloud of suspicion, the lawsuit was assigned to the courtroom of a judge known by everyone to be friendly to Daley and the Democratic party – Circuit Court Judge Thomas Kluczynski. After predictably dismissing the lawsuit, Kluczynski would later be rewarded by President Kennedy, upon a request by Mayor Daley, with an appointment to the federal bench. Eventually, however, a special prosecutor was assigned to the case and brought charges against 650 people accused of committing voter fraud but none resulted in convictions. Three Chicago election workers were convicted of voter fraud in 1962 and served short terms in jail. There were verified accounts of voter fraud in Texas as well. Fannin County had only 4,895 registered voters, yet 6,138 votes were cast, 75% of which went to Kennedy. In one precinct in Angelina County, only 86 people voted yet the final tally was 147 for Kennedy and 24 for Nixon. But Texas refused to conduct a recount. The Texas Election Board consisted entirely of Democrats and it went ahead and certified John Kennedy the winner in Texas. After numerous Democratic judges dismissed Republican charges of voter fraud, Kennedy was inaugurated. Following Kennedy’s inauguration, the U.S. Department of Justice performed an inconclusive investigation into the accumulated evidence of voter fraud. The head of the DOJ was none other than U.S. Attorney General Bobby Kennedy, brother of you-know-who. Instances of voter fraud are simply not punished and the threat of such therefore provides no meaningful deterrent. In addition to this noteworthy collaboration, the US DOJ has vowed to aggressively fight state Voter ID laws and efforts to purge voter rolls of non-eligible voters, which just happens to be required by federal law (the National Voter Registration Act of 1993, or “NVRA”). One can only hope that Eric Holder will be rendered incapacitated by contempt charges and letters calling for his resignation and not be effective at interfering with the states’ responsibilities. And in fact, the bullying has begun. In May, Florida Governor Rick Scott decided to clean up the state’s voter rolls. His goal was to identify those who are noncitizens and remove them so that those illegal votes can’t negate the votes of legal citizens. To identify those noncitizens most effectively – to most accurately verify the citizenship of registered voters –Florida’s Attorney General Pam Bondi has requested access to the federal database maintained by Homeland Security (known as SAVE). The Obama administration has denied that access. Without SAVE, Florida’s elections division proceeded with the purge and began comparing the voter rolls with a Florida Department of Highway Safety and Motor Vehicles database, which contains some citizenship information. Unfortunately, that information can be out of date and can lead the state to mistake a lawful voter as a potential noncitizen. In fact, a 91-year-old WWII veteran was mistakenly sent a letter, asking him to prove that he is a lawful citizen. The initial purge based on the comparison of drivers’ license records with voter registration records identified as many as 182,000 registered voters who might not be legal US citizens. Upon further investigation, more than 500 turned out to be actual citizens and lawful voters and so the initial list was eventually narrowed to approximately 2,600. But state and county officials say they have found at least 141 verified noncitizens on the voter rolls so far, at least 47 of whom have unlawfully cast ballots. Governor Scott has asked county election officials to remove those 2,600 persons from the state’s voter rolls. Later that day, the Justice Department filed suit against Florida, ironically also under Section 8 of the NVRA (among other authority), to block its voter purge noncitizens and to stop further attempts before the November election. Governor Rick Scott said Florida will refuse to comply. He said: “I have an obligation to enforce the laws of our land. You don’t get to vote in Florida if you’re a non-US citizen.” He defended the purge as an effort to protect Florida citizens from having their votes diluted by those ineligible to vote. Holder claims the purge unfairly targets illegal Latino residents. Of course, we all know it is a federal crime for an illegal alien to register to vote or to vote in U.S. elections. Yet, rather than enforcing federal law, the Obama-Holder Department of Justice is intent upon punishing states that purge their rolls or enact laws requiring voter ID. Liberal groups and the DOJ are concerned with the quality of the 2,600-person list of potential noncitizens generated by the state. So far, 53 percent of those removed from the list as being confirmed noncitizens are minorities. Since Hispanics and Haitians are Florida’s largest immigrant group, any search of noncitizens will disproportionately target them. Yet liberal groups are using numbers like this as proof that Florida’s voter purge is “racist” and the DOJ, the federal organization dedicated to protecting the rights of everyone except those who are white, is biting. According to liberal groups, the voter purge is discriminatory because non-Hispanic whites and Republicans are the least likely to face the prospect of being identified as noncitizens and removed from the rolls. Of course, there is a very likely explanation for that: Conservatives are the group most likely to engage in lawful and ethical conduct. As if the Obama Justice Department’s attack on the sovereign responsibility of Florida to provide a clean and legal voting process isn’t bad enough, Judicial Watch has uncovered proof that the DOJ is partnering with Project Vote, which is Obama’s former employer (“community organizer”) and which connected to ACORN, to aggressively enforce a provision in the NVRA forcing states to register greater numbers of voters on public assistance. Watch out in November for the Democrats’ “Food Stamp Army.” Again, ACORN’s playbook and modus operandi includes voter fraud. Apparently, “community organizing” is code for “illegal voting.” [See NRVA under “Notes” below]. Unfortunately, our nation’s top law enforcement agency, the Obama Justice Department, is aggressively enforcing a provision of the NVRA that requires states to register voters on public assistance, while ignoring/undermining a provision that requires states to ensure that each voter is eligible to vote. Voting rights are important because they protect so many other rights. They protect the people’s voice in government. The integrity of the election process to safeguard “one person, one vote” must be maintained and all state officials should be concerned with the state’s legitimate interest in protecting that constitutional principle and managing the election process for fair and confident results. Whether a person is turned away at the polls because he or she can’t afford to pay a $2.00 voting fee or a person commits an act of voter fraud, the result is exactly the same – a citizen of the United States is denied the opportunity to participate in the democratic process that ties he or she to the conduct of government. In each case, it’s an injustice. In this era of documented voter fraud, states have the legitimate responsibility under the Tenth Amendment to enact fair and meaningful schemes to protect the integrity of the election process. Citizens need to believe that the system has not been compromised or broken. They need confidence. They are entitled to that confidence. I have an Equal Protection concern. My husband and I pay a ton of money in federal income tax and so we have a legitimate stake in the policies of government and therefore the voting process, yet not a single person from government has checked to make sure that we have been provide with voter registration forms or helped us submit those forms. No one from government has made sure that my children have been provided with registration forms, helped them fill them out and submit them. No one from government has made sure that any one in my family has been served so personally. Strict Photo ID: Voters must show a photo ID in order to vote. Voters who are unable to show photo ID at the polls are permitted to vote a provisional ballot, which is counted only if the voter returns to election officials within several days after the election to show a photo ID. At the beginning of 2011, there were just two states–Georgia and Indiana–with strict photo ID laws. Six states passed strict photo ID laws in 2011, although four are not currently in effect (see the notes below Table 1 for more information regarding effective dates for new legislation). That leaves four states with strict photo ID laws currently in effect. Photo ID: Voters are asked to show a photo ID in order to vote. Voters who are unable to show photo ID are still allowed to vote if they can meet certain other criteria. In some states, a voter with ID can vouch for a voter without. Other states ask a voter without ID to provide personal information such as a birth date, or sign an affidavit swearing to his or her identity. Voters without ID are not required to return to election officials after the election and show a photo ID in order to have their ballots counted in the manner that voters without ID in the strict photo ID states are. Non-Photo ID: All voters must show ID at the polls. The list of acceptable IDs is varied and includes options that do not have a photo, such as a utility bill or bank statement with the voter’s name and address. Rhode Island passed a new voter ID law in 2011. It takes effect in stages — beginning in 2012, voters will be required to show an ID (although not necessarily a photo ID) at the polls, and in 2014 a photo ID requirement will take effect. Alaska, Arizona, Arkansas, Colorado, Connecticut, Delaware, Kentucky, Missouri, Montana, North Dakota, Ohio, Oklahoma, Rhode Island, Utah, Virginia, and Washington. February 9, 2012: South Carolina filed for reconsideration of the U.S. Department of Justice’s denial of preclearance for its new Voter ID law. The DOJ denied South Carolina’s request for pre-clearance in December 2011. The DOJ found the law discriminatory because the state’s minority voters are 20 percent more likely than white voters to lack a photo ID that meets the standard for voting. March 12, 2012: The U.S. Department of Justice has denied pre-clearance for Texas’s new Voter ID law, passed in 2011. March 12, 2012: A state judge ruled Wisconsin’s Voter ID law unconstitutional. April 5, 2012: The Minnesota legislature approved HF 2738, sending a constitutional amendment to the November 2012 ballot that will allow voters to approve or reject Voter ID. June 7, 2012: The New Hampshire General Court sent a Voter ID bill to the governor. It would require voters to show a photo ID before voting, but it is not of the “strict” variety passed in other states over the past two years. A voter without ID would be permitted to vote after executing an affidavit of identity. The secretary of state would be required to send a letter to each voter who executed an affidavit in lieu of showing ID, asking the person to confirm that s/he did in fact vote. Any such letters returned as undeliverable, or returned by people saying they did not vote, would be turned over to the Attorney General for investigation of voter fraud. June 12, 2012: The US DOJ filed suit against the state of Florida to stop it from purging its voter rolls of noncitizen voters. Crawford v. Marion County Election Board, 553 U.S. 171, pg. 172 (2008).